Posted by jbwan in Photography. 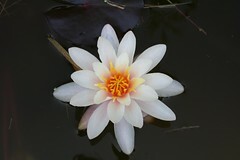 Shot a photo almost identical to this one last year but the poor lily flower was covered in small flies. This year however, Rose Nymphe is shown in true splendour having opened for the first time on Sunday morning. If like me you’ve run into the wonders of WordPress permalinks previously and hit brick walls such as 404 and 403 HTTP errors when you change from the default ?p=ID to the pretty /blog/2007/07/12/entry, then this post is for you and the many other people who have asked me this question previously. 🙂 Not sure why considering the fact that I use MovableType as my blogging software but anyway!